The cancer tissue atlas contains gene expression data based on protein expression patterns in 216 different cancer samples representing the 20 most common forms of human cancer. 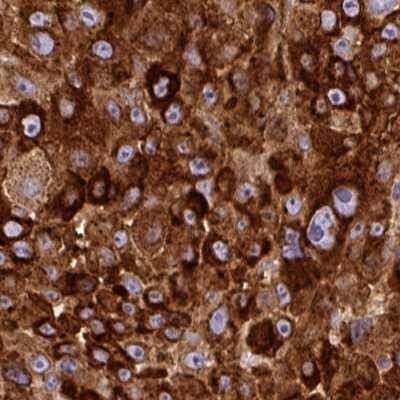 Protein expression data is derived from antibody-based protein profiling using immunohistochemistry. The data is presented as pathology-based annotation of protein expression levels. 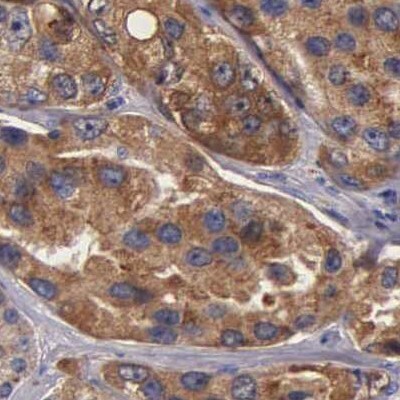 All underlying images of immunohistochemistry stained cancer tissues are available as high-resolution images in the cancer tissue atlas together with basic information regarding age, gender and tumor phenotype. The protein data includes protein expression levels corresponding to 16333 genes for which there are available antibodies. Selective cytoplasmic expression in melanomas. All other malignant tissues were negative. 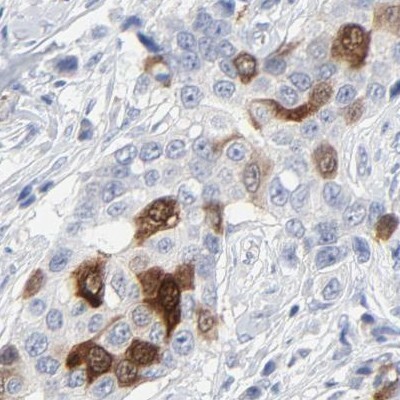 Distinct cytoplasmic and nuclear expression in a subset of tumor cells in most malignant tissues.